Growing up, I didn’t have much in terms of financial role models. My mom used to say blanket statements like ”debt is bad” and ”always pay your credit card balance in full” but she never explained details about money. Details about how to manage my money, how to allocate savings or even encouraging me to save. I think she was just relieved that when I got a job she was no longer on the hook to ‘support’ me and my social habits. I grew up always spending any money earned. I managed to save a few bucks for my wedding but that was the extent of my savings. Even though I started working when I was 15, it wasn’t until I was in my mid 20’s that I began to understand the logic behind emergency funds and planning for a ”rainy day”. Though I had a savings account my entire life, it remained empty 99% of the time. 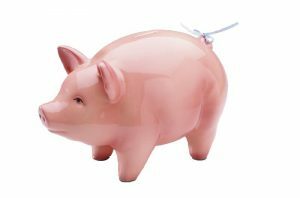 Educating your children early on how and why one saves money is so important. When I think about how much money let pass through my fingers over the last 15 years a small piece of my soul dies. If you want to raise a child who understands and respects money, it is so, so, important that you start young. Giving an allowance before they start earning their own money is an easy way for children to learn the ins and outs of money management. The allowance money should come from your budgeted monthly amount for your children. If, for example you have allocated $50 per month for ”kids” which can include anything from haircuts to lunch money, give your child a percentage of that money for them to manage. This will be done within you guidance but have them learn about money; spending, saving and budgeting. Have them help you shop and budget for their things. This way they will understand that they only have $25 to buy pants, therefore rather than whining in the store about the why they can’t have the $50 jeans they will need to shop around. A percentage of their allowance needs to go into savings. Teach them early about the importance of saving for things. If they really want those $50 jeans, they’re going to have to save up for them. Not everything can be purchased immediately and will require financial planning and preparation. This is applied to everything from the purple My Little Pony they want to the university education they aspire to obtain. As kids get older, give them opportunity to make more money. Money that can be made beyond upholding normal household expectations (ie don’t pay them for making their bed). If they’re saving for something or would like to have extra money for something have them work for it. This will depend on the age but something like cleaning dads car for $20, helping clean the yard in preparation for winter for $30 sort of thing. The point is that kids need to understand early that money comes from hard work, and building savings, not from mom and dad’s wallet. If children grow up assuming money will just appear when they need it, they will fail. When kids get they first real paying job it is important that a percentage of their pay goes directly into savings. This will be decided upon between kids and parents but agree on a spending and savings amount and enforce it. Saving early will establish long-term good habits. Did you start saving young? How are you encouraging your kids to save?